Milford – On July 2, 2018, Faye A. Hickman went home to be with the Lord at Bayhealth in Milford. 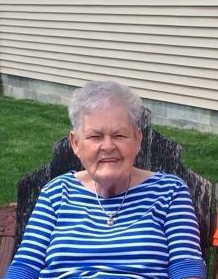 She was born on April 29, 1934 in Milton, DE to the late John and Grace Coffin. Faye graduated from Milford High School, class of 1952. Mrs. Hickman worked as a Sales Clerk at the Milford Sears for many years. She and her husband Philip were members of Calvary Baptist in Georgetown. Faye enjoyed reading her bible, shopping at Walmart, and was known for keeping a tidy house. She was preceded in death by her husband Philip E. Hickman. Faye is survived by her daughters, Linda F. Hickman Lindale and her husband John of Amory, MS, Phyllis E. Hickman Walker and her husband P.J. of Milford, and Karen L. Hickman Irvin and her husband Johnny of Milford, her grandchildren, Ashley Lindale, Amanda Irvin, Amber Fleetwood, Lacey Wilson, Jeremiah Lindale, and Bryan Walker, and ten great grandchildren. The family will receive visitors at Calvary Baptist Church, 22860 DuPont Blvd., Georgetown from 10 - 11AM on Saturday July 7th, with a funeral service at 11AM. Interment is Slaughter Neck Cemetery. In lieu of flowers, donations may be made to Country Rest Home, 12046 Sunset Lane, Greenwood, DE, 19950.